In March 2017, we introduced the preview for SQL Database Premium RS, which was designed for dev/test IO-intensive workloads where a limited durability guarantee and lower SLA were acceptable. We have decided not to take Premium RS to general availability and instead focus our efforts to expand the SQL Database core offerings. We understand that Premium RS did answer a need for some users and we are committed to helping them find alternatives that best meet their use cases. Please do contact us at premium-rs@microsoft.com for any questions, concerns, or comments. 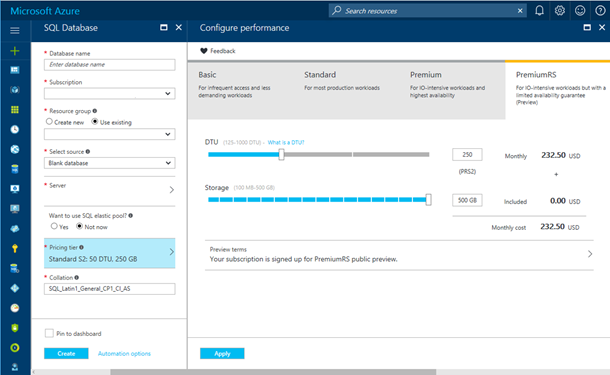 Today we are happy to announce a 4TB increase of storage limits for Premium P11 and P15, and along with it a new, enhanced portal experience for selecting and managing service tiers and performance levels. Adding more choices in our service tiers and increasing the available storage is a crucial step towards reaching our long-term commitment of providing more flexibility. Both for compute as well as storage across all performance tiers, allowing increased flexibility to customers. You can now use up to 4TB of included storage with P11 and P15 Premium databases at no additional charge. Until we have worldwide availability later in CY 2017, the 4TB option can be selected for databases located in the following regions: East US 2, West US, Canada East, South East Asia, West Europe, Japan East, Australia East, Canada Central. For more details refer to the documentation. Select the service tier which corresponds to your workload needs. Select the performance limits (DTU) required by your database. Select the maximum storage required to your database. This added option hopes to make it simpler for you to manage the growth of your databases. Review the pricing page for our new offers. Create a P11 or P15 Premium database with 4TB of storage.